✓ SUPER BRIGHT & IR SENSOR CONTROL : 160 Lumens 3W CREE LED. Just a hand's wave,the headlamp will be On or Off,convenient for Winter outdoor sports at nigh. By 1 press the switch again, it becomes regular. 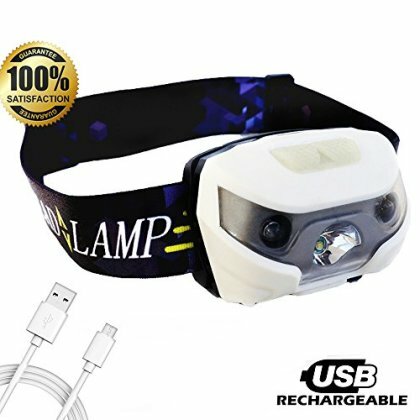 ✓ USB RECHARGEABLE: Charge fully from any USB port in only 6 hours and provide up to 30 hours of constant light on a single charge. Mini USB charging cable included. ✓ WATERPROOF & DURABLE: Withstand heavy rain, cold, heat, dropping on the ground. It is rated IPX4, which means it is protected against splashing or spraying water from any angle. ✓ LIGHTWEIGHT AND COMFORTABLE: You won't even notice wearing it. Weighing only 2.5 ounces with easily adjustable elastic headband,easily comfort to any head size/shape, perfect for long distance runners or anyone looking for a comfortable fit. ✓ YOUR UP-CLOSE DETAIL WORK AND LONG-DISTANCE VIEWING IS NOW A BREEZE - The headlamp body tilts up to 45-degrees, allowing you to focus light where you through single button control.